Canadians right across the political spectrum are opposed to immigrants being allowed to wear facial coverings during the citizenship ceremony, according to the latest results from Vote Compass, CBC's online voter engagement survey. Asked whether immigrants should be allowed to cover their faces for religious reasons while taking the oath of citizenship, 72 per cent of Canadians say no. Only 19 per cent say they are OK with the idea. Vote Compass, which was developed by Vox Pop Labs, asks people to respond to a series of policy questions to determine how their views match up with the positions of the main political parties. It is also posing additional questions on issues that arise during the campaign. Between Sept. 17 and 18, those taking the online survey were asked whether they agreed or disagreed with the following statement: "Immigrants should be allowed to cover their faces for religious reasons while swearing the oath of citizenship." The question garnered 13,930 respondents. The issue has been thrust into the election campaign as a result of a 29-year-old Muslim woman from Pakistan, Zunera Ishaq, who went to court seeking the right to wear a niqab when reciting her oath of Canadian citizenship — and, subsequently, be allowed to vote in the federal election on Oct. 19. A ministerial directive issued in 2011 banned face coverings at citizenship ceremonies, but Ishaq successfully challenged that order in Federal Court and won. That ruling was upheld by the Federal Court of Appeal last Wednesday. In response to Wednesday's ruling, the government asked the ruling be put on hold while it seeks leave to appeal to the Supreme Court of Canada. Asked about it on Friday, Conservative Leader Stephen Harper said, "When you join the Canadian family in a public citizenship ceremony, it is essential that that is a time when you reveal yourselves to Canadians, and that is something widely supported by Canadians." The findings from Vote Compass largely bolster this claim. When broken down along party lines, the results show that Bloc Québécois and Conservative supporters were most opposed to the idea of allowing people to cover their faces during citizenship ceremonies — 96 per cent and 92 per cent, respectively. NDP, Liberal and Green supporters were less opposed, with 62, 57 and 51 per cent, respectively, saying face coverings shouldn't be allowed during this type of ceremony. On the other hand, 31 per cent of Green supporters, 29 per cent of NDP supporters and 28 per cent of Liberal supporters agree that it should be allowed. The issue is often "framed as religious freedom, but it's also an issue about cultural norms, and right across the spectrum you're seeing that Canadians are very uncomfortable with people covering their face for whatever reason," says Kyle Matthews, senior deputy director for the Montreal Institute for Genocide and Human Rights Studies at Concordia University. The niqab issue is not something that touches most Canadians directly, Matthews notes. But he says many people believe it represents larger concerns about the perils of religious accommodation in today's society, particularly when that involves Muslims. Liberal Leader Justin Trudeau has pointed out that prior to writing and passing her citizenship test in 2013, Zunera Ishaq did remove her niqab in order to be properly identified by an immigration official. Trudeau has said the government's approach to the issue "frays away the edges of our multicultural fabric." The issue is most heated in Quebec, where the notion of reasonable accommodation was a major issue during the 2014 provincial election. While many commentators believe the Parti Québécois' pursuit of a so-called charter of values was a prime reason for its defeat, religious accommodation remains contentious in Quebec. 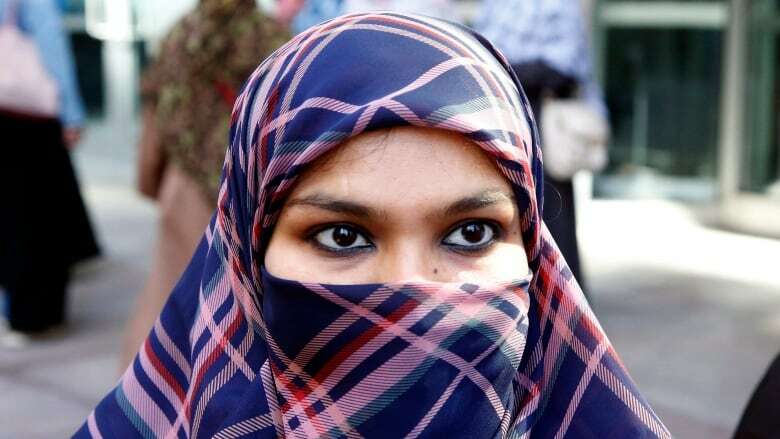 According to the Vote Compass results, Quebecers are most opposed to facial coverings in citizenship ceremonies (90 per cent), followed by people in Alberta, Saskatchewan and Manitoba (72 per cent), the Atlantic provinces (68 per cent), Ontario (66 per cent) and B.C. (58 per cent). Christopher Cochrane, a professor of political science at the University of Toronto, says this is "a textbook wedge issue, and also one of the few roads into Quebec for the Conservative party." The Conservatives and the Bloc have been vocally opposed to facial coverings in public ceremonies. While the Liberals and NDP have suggested a more inclusive stance, their positions have been tougher to pin down, says Cochrane. For those parties, weighing in on the niqab issue is a tricky proposition, especially in Quebec. "If Mulcair or Trudeau were to express support for a ban or a restriction, they'd alienate a pretty reasonable chunk of their support base," says Cochrane. At the same time, "if the Conservatives can make any inroads in [Quebec], then that's a way of undercutting support precisely where the Liberals and New Democrats are far and away in the lead." Developed by a team of social and statistical scientists from Vox Pop Labs, Vote Compass is a civic engagement application offered in Canada exclusively by CBC News. The results above are based on 13,930 respondents who participated in Vote Compass on Sept. 17 and Sept. 18. Unlike opinion polls, respondents to Vote Compass are not randomly selected. Similar to opinion polls, however, the data are a non-random sample from the population and have been weighted in order to approximate a representative sample. Vote Compass data have been weighted by geography, gender, age, educational attainment, occupation, religion, religiosity and civic engagement to ensure the sample's composition reflects that of the actual population of Canada according to census data and other population estimates. Stephen Harper's 'old-stock Canadians': Politics of division or simple slip?